The Algarve (UK: /ælˈɡɑːrv/, US: /ɑːlˈɡɑːrvə, æl-/, Portuguese: [aɫˈɡaɾvɨ]) is the southernmost region of continental Portugal. It has an area of 4,997 km2 (1,929 sq mi) with 451,006 permanent inhabitants, and incorporates 16 municipalities. The region has as its administrative centre in the city of Faro, where both the region's international airport (FAO) and public university, the University of Algarve, are located. Tourism and related activities are extensive and make up the bulk of the Algarve's summer economy. Production of food, which includes fish and other seafood, different types of fruit such as oranges, figs, plums, carob beans, and almonds, is also economically important in the region. Although Lisbon surpasses the Algarve in terms of tourism revenue, the Algarve is still, overall, considered to be the biggest and most important Portuguese tourist region, having received an estimated total of 7.1 million tourists in 2017. Its population triples in the peak holiday season due to seasonal residents. The Algarve is also increasingly sought after, mostly by central and northern Europeans, as a permanent place to settle. A 2016 American-based study concluded that the Algarve was the world's best place to retire. The Algarve is one of the most developed regions of Portugal and, with a GDP per capita at 86% of the European Union average, the third-richest (behind Lisbon and Madeira). Human presence in southern Portugal dates back to the Paleolithic and Neolithic periods. The presence of megalithic stones in the area of Vila do Bispo attests to this presence. The Cynetes, influenced by Tartessos, were established by the sixth century BC in the region of the Algarve (called Cyneticum). They were strongly influenced by the Celtici. Those Indo-European tribes, Celtic or pre-Celtic, founded the city of Lagos (then called Lacóbriga). The Phoenicians had established trading ports along the coast c. 1000 BC. Some sources claim that the Carthaginians founded Portus Hanibalis – known today as Portimão – c. 550 BC. Much of the Iberian Peninsula was absorbed into the Roman Republic in the second century BC (despite the resistance of the Lusitanians and other tribes), and the Algarve region similarly came under Roman control. Many Roman ruins can still be seen, notably in Lagos, but also at Milreu. Roman bath complexes and fish-salting tanks have been found near the shore in several locations, for example the ones near Vilamoura and Praia da Luz. In the fifth century, the Visigoths took control of the Algarve until the beginning of the Umayyad conquest of Hispania in 711. When the Moors conquered Lagos in 716, it was named Zawaia. Faro, which the Christian residents had called Santa Maria, was renamed Faraon, which means "settlement of the knights". Due to the conquest of the Iberian Peninsula, the region was called Gharb Al-Andalus: Gharb means "the west", while al-Andalus is the Arabic name for the Iberian Peninsula. For several years, the town of Silves was the capital of the region. In the mid-13th century, during the Reconquista, the Kingdom of Portugal conquered the region in a series of successful military campaigns against the Moors. Al-Gharb became the Kingdom of the Algarve, and the moors were expelled, but battles with Muslim forces persisted. The Portuguese finally secured the region against the subsequent Muslim attempts to recapture the area in the early 14th century. King Afonso III of Portugal started calling himself King of Portugal and the Algarve. After 1471, with the conquest of several territories in the Maghreb – the area considered an extension of the Algarve – Afonso V of Portugal began fashioning himself "King of Portugal and the Algarves", referring to the European and African possessions. Prior to the independence of Brazil, "United Kingdom of Portugal, Brazil and the Algarves" (1815–1822) was an official designation for Portugal which also alluded to the Algarve. Portuguese monarchs continued to use this title until the proclamation of the First Portuguese Republic in 1910. Between 1595 and 1808, the Algarve was a semiautonomous area of Portugal with its own governor, as well as a separate taxation system. In the 15th century, Prince Henry the Navigator based himself near Lagos and conducted various maritime expeditions which established the colonies that comprised the Portuguese Empire. Also from Lagos, Gil Eanes set sail in 1434 to become the first seafarer to round Cape Bojador in West Africa. The voyages of discovery brought Lagos fame and fortune. Trade flourished and Lagos became the capital of the historical province of Algarve in 1577 and remained so until the fabled 1755 Lisbon earthquake. The earthquake damaged many areas in the Algarve and an accompanying tsunami destroyed or damaged coastal fortresses, while coastal towns and villages were heavily damaged except Faro, which was protected by the sandy banks of Ria Formosa lagoon. In Lagos, the waves reached the top of the city walls. For many Portuguese coastal regions, including the Algarve, the destructive effects of the tsunami were more disastrous than those of the earthquake itself. In 1807, while Jean-Andoche Junot led the first Napoleonic invasion in the north of Portugal, the Algarve was occupied by Spanish troops under Manuel Godoy. Beginning in 1808, and after subsequent battles in various towns and villages, the region was the first to drive out the Spanish occupiers. During the Portuguese Civil War, several battles took place in the region, especially the battle of Cape St. Vicente and the battle of Sant’Ana, between liberals and Miguelites. Remexido was the guerrilla Algarvian leader who stood with the Miguelite absolutists for years, until he was executed in Faro in 1838. The establishment of the First Portuguese Republic in 1910 marked the end of the Kingdom of Portugal and the Algarve. The Algarve covers 4997 km2, extending just south of the Tagus valley to the southern coast of the Iberian Peninsula. Its highest point is Fóia, 902 m (2,959 ft), in the mountain range of Monchique. It also includes some islands and islets. The region is also the home of the Ria Formosa Lagoon, a nature reserve of over 170 km2 and a stopping place for hundreds of different species of birds. The length of the south-facing coastline is roughly 155 km. Beyond the westernmost point of Cape St. Vincent it stretches a further 50 km to the north. The coastline is notable for picturesque limestone caves and grottoes, particularly around Lagos, which are accessible by powerboat. The maximum recorded temperatures in the Algarve fluctuate between 25 °C (77 °F) in winter and 48 °C (118 °F) in summer, with the temperature rarely falling below freezing in the winter. The winter of 2008–09 was exceptionally cold and wet. Temperatures below 0 °C (32 °F) were recorded in coastal areas for the first time in many years. The interior of the Algarve consists of small villages and is sparsely inhabited. About 450,000 permanent inhabitants (90 residents per km2) live in the area, although this figure increases to over a million people at the height of summer, due to an influx of tourists. The Algarve has several cities, towns, and villages; the region's capital is the city of Faro, while other cities include Albufeira, Lagoa, Lagos, Loulé, Olhão, Portimão, Quarteira, Silves, Tavira, and Vila Real de Santo António, in addition to various summer retreats such as Vilamoura, Praia da Rocha, Armação de Pêra, Alvor, Monte Gordo, Tavira, and Sagres. A complex of apartments overlooking the beach in Praia da Rocha, Portimão. The Algarve relies heavily on the tourism industry. The Algarve features some of Europe's top golf courses. Agricultural products of the region include fig, almond, orange, carob bean, strawberry tree, and cork oak. Horticulture is important and the region's landscape is known for the large areas of land covered with plastic greenhouses which are used to that end. Fishing and aquaculture are important activities in the coastal area of the Algarve, with sardines, soles, cyprinids, gilt-head bream, and various seafood, including the grooved carpet shell, being the major products. The Algarve's wines are also renowned. Four wines in the region have Protected Designation of Origin (Denominação de Origem Controlada – DOC): Lagoa DOC, Lagos DOC, Portimão DOC, and Tavira DOC. Food processing, cement, and construction are the main industries. Tourism-related activities are extensive and make up the bulk of the Algarve's economy during summer. The Algarve's economy has always been closely linked to the sea, and fishing has been an important activity since ancient times. Only since the 1960s has the region embraced tourism, which has become its most important economic activity. With the increase in life quality and purchasing power, many shopping malls have been constructed, mostly in the past 15–20 years. Recently,[when?] an Ikea opened in Loulé, one of five in Portugal. In 2017, the Algarve was the Portuguese region that experienced the biggest economic growth, an increase of 4.6% of its GDP. The Algarve has been experiencing a strong development since the beginning of the 1960s, initially due to the need to accommodate its foreign visitors. The region started the construction of better infrastructure, mainly roads, sanitation, power grids, telecommunications, hospitals, and housing. Due to the austerity measures introduced in 2011, tolls were placed on the main motorway that crosses the region to offset the expense of its maintenance. Private investors, with the support of municipalities, also began the construction of a variety of hotels, resorts, golf courses (which are considered to be some of the best in Europe), and villas. All this led to a large development in the region, especially for the locals, who had previously lived in harsher circumstances. Today, the Algarve is amongst the regions in Portugal with best quality of life. In the 1960s, the Algarve became a popular destination for tourists, mainly from the United Kingdom. It has since become a common destination for people from Germany, the Netherlands, and Ireland. Many of these tourists own their own property in the region. Algarve-based publications and newspapers are written in English specifically for this community. In recent years, the Algarve has seen a high increase in tourists from Spain, France, and Italy, followed by Canadians, Americans, and Australians. Portuguese people from other parts of the country also visit the region in large numbers, especially in the peak of the summer (July and August). Tourist attractions in the region include its beaches, Mediterranean climate, safety, cuisine, and relatively low prices. Well-known beaches in the Algarve range from Marinha Beach to Armação de Pêra. A well-known spa town is Caldas de Monchique. 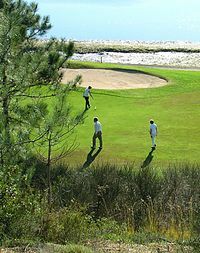 In addition to its natural features and beaches, the Algarve has invested in the creation of a network of golf courses. The Algarve is also popular for religious tourism, notably pilgrimages to the Sanctuary of Our Lady of Piety (best known as the Sovereign Mother), a Marian shrine dedicated to the patron saint of Loulé, that attract thousands of pilgrims of the Catholic faith to the city, or with the international pilgrimages to the apparitions site of Our Lady Mother of Goodness occurred near São Marcos da Serra. The procession of the Sovereign Mother (Our Lady of Piety) attracts thousands of pilgrims to the Marian shrine of Loulé, in the Algarve. The Algarve's mild climate has attracted interest from Northern Europeans wishing to have a holiday home or residence in the region. Being a region of Portugal, and therefore in the European Union, any EU citizen has the right to freely buy property and reside with little formality in the Algarve. British expatriates, followed by Germans, Dutch, and Scandinavians, are among the largest groups wishing to own a home in this sunny region of Portugal. Tourism plays an important role in the economy of the Algarve. A large number of seasonal job opportunities are tourism-related and are fulfilled by thousands of locals and immigrants. Due to its seasonal nature, most of the economy relies on the good weather available mostly for only about 5–6 months (characterised by a prolonged lack of rain and temperatures above 30 °C throughout the day), meaning that many Algarvians go unemployed during the low season. Nonetheless, due to the very high monetary income that the high season brings, most people in the Algarve are still able to have comfortable lives even while unemployed. In March 2007, the Portuguese economic minister, Manuel Pinho, announced the creation of the "Allgarve" brand, as a part of a strategic promotion of the Algarve as a tourism destination for foreign citizens. According to World Travel Awards, the Algarve was Europe's leading golf destination in 2013 and 2014. Over 25 top-class courses are located in the Algarve, most of which were designed by legendary names such as Nick Faldo, Seve Ballesteros, Jack Nicklaus, and Christy O'Connor, Jr.
Accommodation in the Algarve ranges from high-rise resorts in places such as Albufeira to traditional guesthouses located in the small towns and villages surrounding the Algarve coast. Over the past few years, many tourists visiting the Algarve have moved away from the resorts, and have chosen the comfort of a traditional Algarve guesthouse. The University of Algarve, headquartered in Faro, with an extension in Portimão, is a public university which awards all academic degrees in fields ranging from marine biology to economics to environmental engineering. Also, students are served by several private higher-education institutions (Piaget – Silves and others), state-run and private secondary schools, including a number of international schools, and a wide network of kindergartens and primary schools. The 30,000-seat Algarve Stadium (Estádio Algarve) was built as a venue for UEFA Euro 2004. The Algarve has many sports clubs, including football teams (S.C. Olhanense, Portimonense S.C.) which play in the first, second, and third lay tiers of professional football. S.C. Farense is the most successful football club in the Algarve and play in the Campeonato de Portugal. Some other ancient sports clubs (football teams) from the region are Esperança de Lagos, Lusitano FC (Vila Real de Santo António), and Silves FC. Portuguese Water Dogs are native to the Algarve; they were the fisherman's main companion and often accompanied sailors during the Portuguese discoveries. The Algarve once had the largest population of the Iberian lynx in Portugal. However, no lynxes in the wild have been reported in the region since 2003. The Algarve is famous for its pottery and ceramics, particularly hand-painted pottery and azulejos, which are painted, tin-glazed ceramic tiles. Numerous ceramics and pottery outlets are open throughout the Algarve. For working potteries and ceramics workshops, the main (or best-known) pottery centers are located in the towns of Almancil, Porches, and Loulé, but many other potteries and workshops are in the Algarve region. Corridinho is the traditional dance of the Algarve. ^ a b "EU Regions". Eurostat. ^ "Algarve". The American Heritage Dictionary of the English Language (5th ed.). Boston: Houghton Mifflin Harcourt. 2014. Retrieved 13 April 2019. ^ "Algarve". Collins English Dictionary. HarperCollins. Retrieved 13 April 2019. ^ "Algarve". Oxford Dictionaries. Oxford University Press. Retrieved 13 April 2019. ^ "Algarve". Merriam-Webster Dictionary. Retrieved 13 April 2019. ^ a b "Statistics Portugal". ine.pt. ^ a b "Law nr. 75/2013" (pdf). Diário da República (in Portuguese). Assembly of the Republic (Portugal). Retrieved 13 August 2014. ^ "Lisboa ultrapassa pela primeira vez 1.000 milhões de euros em receitas de alojamento turístico" (Economy). O Jornal Económico. Archived from the original on 2 March 2018. Retrieved 26 February 2018. ^ "Algarve com 4,2 milhões de turistas e 20 milhões de dormidas oficiais em 2017 - AHETA" (Economy). Diário de notícias. Retrieved 26 February 2018. ^ "Algarve once again elected best place in the world to retire". The Portugal News. 18 August 2016. Retrieved 22 November 2018. ^ "GDP per inhabitant ranged from 28% of the EU27 average in Severozapaden in Bulgaria to 343% in Inner London". europa.eu. ^ CM-FARO. "Milreu Roman Ruins". www.cm-faro.pt. Retrieved 27 February 2017. ^ "Remexido". Algarve Primeiro (in Portuguese). Retrieved 27 February 2017. ^ "Monthly Averages for Faro, Portugal". World Meteorological Organization. Retrieved 5 September 2012. ^ AMAL. "AMAL :: Comunidade Intermunicipal do Algarve". amal.pt. ^ "Contributo do Algarve para o PIB Nacional pode chegar aos 4,6% em 2017". Sul Informação. Sul Informação. Retrieved 26 February 2018. ^ "On the Rights of Citizens of the Union ...", EC Directive 2004/58 EC, retrieved 25 May 2007. ^ "Europe's Leading Golf Destination 2013 — World Travel Awards". Worldtravelawards.com. Retrieved 31 January 2014. Wikimedia Commons has media related to Algarve. Wikivoyage has a travel guide for Algarve.